By now, most of you have probably heard about the incandescent light bulb phase-out starting this year (likely as a result of the ridiculous political bickering about the lighting legislation in the count-down to the end of 2011). However, a quick survey of your friends will reveal that few of us actually understand what it entails. The law is merely a way to encourage consumers to purchase more energy-efficient light bulbs – such as LEDs – that will save money and energy, both resources that we could all use more of at the moment. If you’re still unclear about what the incandescent phase-out means in terms of what kinds of light bulbs you’ll be able to find at stores in the coming years, or how you can switch to LED light bulbs while still maintaining the same quality and quantity of light supplied by your old incandescents, read on as we spell it out for you in our easy guide. And though we will be seeing less and less of Thomas Edison‘s most famous invention over the next few years, we think that even Mr. Edison would be swapping his incandescent bulbs for LEDs if he were alive today! Despite what some Republicans have been claiming, the Energy Independence and Security Act does not ban incandescent light bulbs. Instead, it mandates that new light bulbs sold in stores be at least 25% more efficient than current models, and have labels on the front and back of packages to explain their brightness, annual operating costs and expected life span. Yes, that does mean that many incandescents will not make the cut as the energy standards get more stringent, but the legislation will give a huge boost to the U.S.’s energy efficiency and cut strain on our national grid. It’s called a phase-out for a reason. Only 100-watt incandescent bulbs will be cleared off of store shelves in 2012 (If these bulbs remain unsold, they can remain on shelves but retailers will not be able to restock/re-order these types of bulbs.) Then in 2013, the phase-out will apply to 75-watt incandescent bulbs and finally in 2014, the 40-watt and 60-watt incandescent bulbs will phased out. 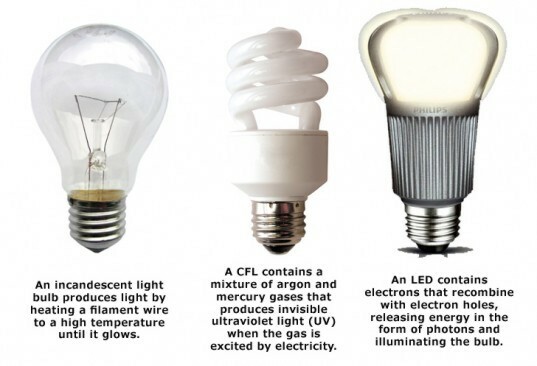 Other incandescent bulbs, like candles, decorative and reflector bulbs will also be affected. If, for some reason, you love using energy-guzzling incandescent bulbs and want to continue using them, no law is going to stop you. In other words, no lighting police is going to come to your home and check in on what kind of bulbs you’re using. You’ll have a harder time finding incandescent bulbs in stores as time goes on and you’ll be wasting money and energy (traditional incandescent bulbs lose 90% of their energy as heat rather than light), but if you prefer to use incandescents and rack up a crazy energy bill, you will still be able find the energy-guzzlers in select stores for years into the future. If that last point hit close to home for you, you’re not alone. Many people are under the (false) impression that energy-efficient bulbs cast a “sickly” glow and just don’t have a warm ambiance. That might have been true in the past with certain types of compact fluorescent bulbs (which often have a greenish hue), but nowadays, there are many new high tech options for LED light bulbs that successfully mimic the brightness, amber color temperature and warm “feel” of your favorite filament bulb. Flip to the next page to see our recommendations on how to find the perfect LED replacement bulbs for your specific home lighting needs. When replacing an incandescent bulb, you basically have two options to choose from – CFLs (compact fluorescent lamp) and LEDs (light-emitting diode). In the past, CFL bulbs were more widely used, because they were cheaper, but nowadays, the price of LED bulbs has come down substantially, and the quality of light has improved drastically through new technological innovations. 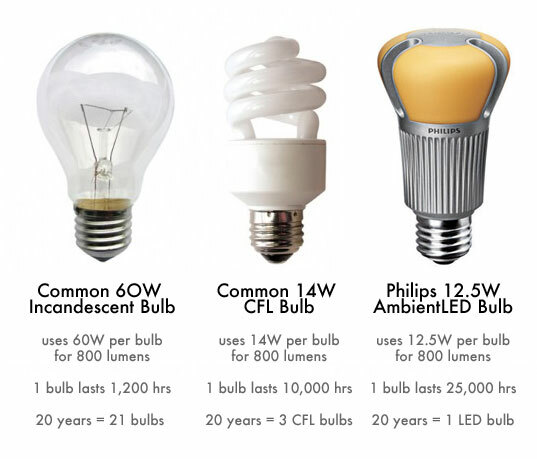 Despite still being more expensive, LED bulbs have many advantages over CFL bulbs that make that price tag well worth it; they consume less energy and last much much longer than CFLs (up to 20 years! ), so any extra money you pay up front is recouped on your energy bill, and when you don’t have to purchase new bulbs every year. On average, an LED light bulb is roughly 3 or 4 times more expensive than a CFL but think about it this way – if you install an LED lamp in your new baby’s bedroom today, you most likely won’t have to buy a new one until after they go off to college! LED lightbulbs also don’t have any mercury in them – unlike CFLs, which can create a hazardous waste site if you accidentally break one in your house. Finally, LED bulbs can be used with dimmers – unlike most CFL bulbs. One of the lamps above uses an incandescent and the other uses a Philips LED. Can you tell the difference? Taking a stroll down the lighting aisle of a store to find incandescent bulb replacements can be intimidating because there are so many shapes and sizes, and the vocabulary on the packaging can be confusing. But pinpointing a few specific points about what you’re looking for can make this task a lot easier. The first thing to ask yourself is what type of light bulb are you looking to replace – a standard A-shaped lamp bulb, a floodlight, a “candle” in a chandelier or something else like a landscape light or a night light? 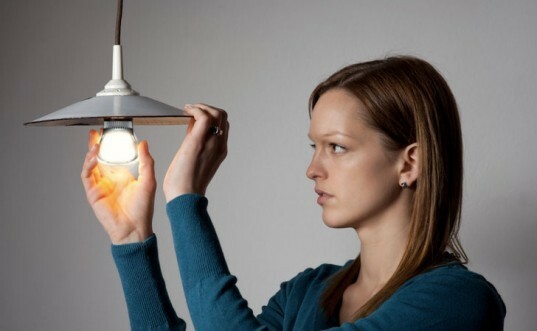 Most of the time, LED versions of all of these types of bulbs closely resemble their incandescent counterparts in size (though the shape might be slightly different), so it’s a good idea to bring the bulb (or “lamp,” if you want to use the term lighting professionals use) with you to the store so you can actually hold it up to your prospective replacement and make sure the bases are the same size. 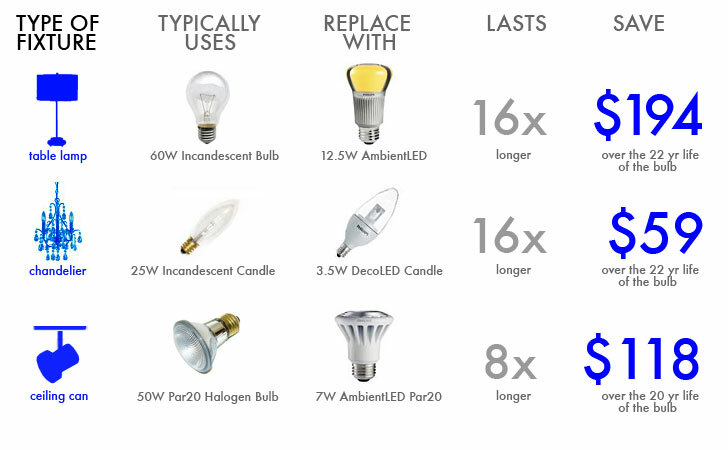 Here are some of the most common examples of incandescent and halogen bulbs, and the LED replacements that are designed to mimic them: For a table lamp or other fixture that uses a 60-watt incandescent bulb, you can replace it with a Philips 12.5 W AmbientLED A19 to save approximately $130 in energy costs over the lifespan of the bulb. For a chandelier or other 25-watt candelabra-style bulb, try replacing it with a Philips 3.5W DecoLED Candle for an approximate savings of $59.13 in energy costs over the lifespan of the bulb. Another common energy-sucking bulb, the standard 50-watt PAR20 halogen bulb (commonly used in recessed ceiling lights) can be replaced with the Philips 7W AmbientLED PAR20 for an approximate savings of $118.25 in energy costs over the lifespan of the bulb. The next thing to check for is the “light appearance,” or color temperature of the light bulb you’re replacing, which is measured on the Kelvin (K) temperature scale. The higher the Kelvin number is, the more blueish white the light will be and the lower it is, the more yellowish it will be. Most light bulbs will be labeled with the type of light appearance they emit (soft, white, bright, warm, daylight) – although those words are often vague and hard to understand, so you’re better off just looking specifically at the Kelvins. The traditional incandescent, which gives off a warm yellowish light, has a temperature of 2,700 to 3,000K — similar to most halogens. Newer CFLs have a wider range, from warm (3,000K) to cold (6,500K). 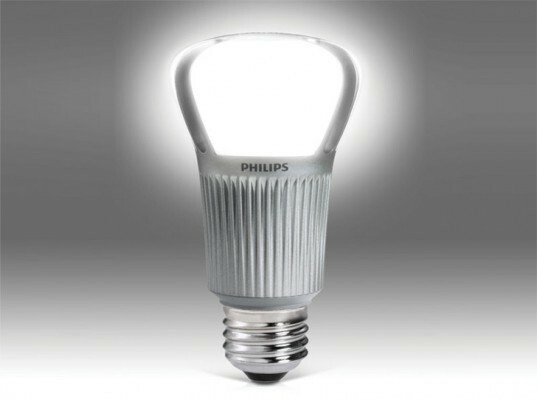 LED bulb temperatures can range from 2,700K to 5,000K, and while previous generations of light-emitting diodes tended to have a very blueish light, there are now LED replacement bulbs on the market (such as Philips’ AmbientLED line) which mimic the color temperature and “feel” of incandescent bulbs exactly – producing warm white light. Since light emitting diodes inherently shine blue, the way the Philips AmbientLED bulbs do this is through their patented orangey-yellow lens casing surrounding the LEDs (see below diagram). Once you have considered light bulb type and color temperature, you’ll also want to consider light bulb brightness, which is measured in lumens for LEDs and incandescent bulbs (weirdly, halogen bulbs tend to be measured in “candelas“) A bulb’s lumen measurements are always displayed on its packaging, so you can easily find out how bright the bulb you’re buying is. Many people still confuse wattage (a measure of electrical energy used) with lighting brightness – but in this day and age of low-energy LED and CFL lightbulbs, don’t be confused by wattage. A traditional 60W incandescent bulb shines at about 800 lumens – the exact same brightness as a Philips’ 12.5W LED bulb or a 14W CFL bulb. One of the most asked questions regarding LED bulbs is whether or not they work with dimmers, and the answer is yes (most CFLs do not)! So if you have dimmers and want to continue using them, go ahead and choose an LED bulb. How many people does it take to screw in a light bulb? Usually just one, but if you’re using a ladder, you might want to have a friend steady it for you. Once you have your more energy-efficient replacements for your incandescents, simply unscrew your old bulbs, and screw in your new LEDs or CFLs. You might want to save the packaging from your new bulbs to wrap around your old bulbs when you discard them. Unfortunately, at the moment, most cities do not recycle incandescent light bulbs so the best way to dispose of your old bulb is to package them up in the box your new bulb came in (this will help keep it from shattering) and simply discard it in your regular garbage. No matter how tempting it is, don’t throw your light bulbs in the recycle bin. 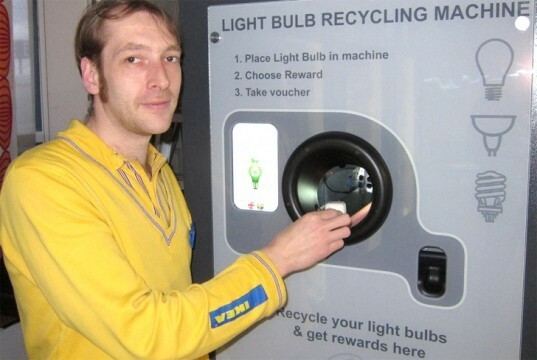 If you really want to try and recycle your incandescent bulbs, some IKEA stores have bulb recycling bins. A lot of the time these are for CFLs, but some stores have separate bins for incandescents. As you learned in our charts on the previous pages of this article, CFLs are different from incandescents and LEDs in that they contain mercury, a material that can be harmful to humans if the liquid is touched, or vapors are inhaled. While CFLs only contain a minuscule amount of mercury, it’s important to dispose of them properly so as not to allow the vapor to escape into your house, or the substance to enter our waste streams and water supply. The best way to recycle your CFL bulbs is to take them to a local in-store recycling program (see a list of participating retailers here) or send them in via an easy mail-back service like the ones listed here. Since we’ve mention that CFL bulbs contain mercury, you might be worried about what to do if one of them breaks in your home. The good news is that CFLs contain only a tiny amount of mercury and they are not likely to present a significant risk to you or your family, but to be on the safe side, it’s important to still take the proper steps to clean them up and dispose of them quickly and carefully. When a bulb breaks, it’s probably your immediate instinct to start picking up the pieces of glass, but in the case of a CFL, the first thing you should do is get everyone (including pets) out of the room and ventilate it as well as you can. Open all of the windows and shut off your central forced-air heating/air conditioning system, if you have one. After 15 minutes or so of ventilation, you can start the cleanup. If you have gloves and a mask, it’s a good idea to put them on. DO NOT use a vacuum cleaner, broom or anything else that might flick the shards around the room. Instead, use a piece of hard paper or cardboard to slowly scoop up the glass fragments and powder and place them into glass jar with a metal lid. Then, use sticky tape to pick the remaining small glass fragments and powder. Lastly, use a damp paper towel to wipe the area clean and dispose of it in the glass jar. If you still see tiny particles around, you can use your vacuum cleaner only on the area where the bulb broke and then immediately clean out the contents and place them in the glass jar or a sealed plastic bag. Then wipe and clean the inside of the vacuum bag or canister. When you feel you’ve removed all of the pieces of bulb, immediately place the glass jar or bags containing the waste in an outdoor trash container, and don’t forget to wash your hands thoroughly! For a more detailed list of these instructions, visit epa.gov. 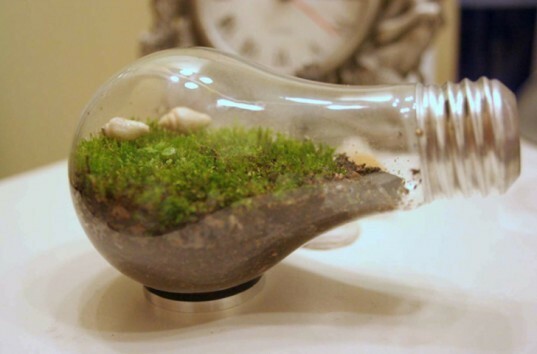 Since there isn’t much you can do in terms of recycling incandescent bulbs, why not get crafty and creative and upcycle them into cute vases (like this one shown above) or terrariums (like this one below). Bam – instant unique birthday or holiday present that says you are awesome, and you really care! Last but not least, you can always hold on to your old incandescent bulb if it isn’t completely dead, since incandescents will be like rare antiques in a few years (okay, maybe that’s a bit of an overstatement). You might even be able to sell it on eBay some day! I am very sensitive to the cool/ blue light. I get migraines and lose my ability to focus. I need to be in a Kelvin rate of 2700 or below to feel okay. Unfortunately that's just on the edge of what's available with LEDs and I have yet to find one that works for me. I wonder how many other people have this issue. Also, if anyone wants to get rid of their incandescents, I'd be happy to take them. If you want to upgrade your lighting system to efficient LEDs without the up-front costs, consider joining the Dollar LED Club. For just a $1/bulb/month you can lease high quality LEDs. After two years the bulbs are yours and you continue to save. 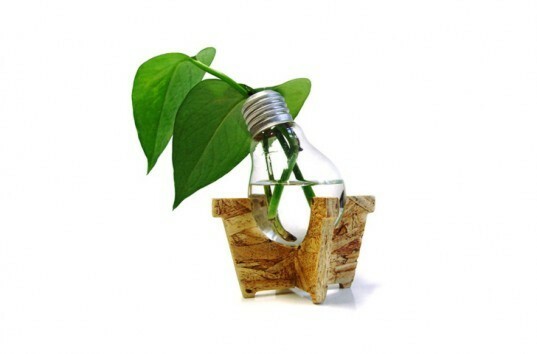 I will not buy CFL's. 1) They all contain mercury and most people don't read the warning on the label that says you must bring blown out CFL's to a hazardous waste facility. that means most of the CFL's go right into our landfills. Not good 2) the vast majority of CFL's are made in China. I prefer to buy products made in the U S. 3) My observation is that if you leave a CFL on all the time it will last a very long time, but if you turn it on/off whenever you enter/leave a room (I do) it won't last much longer than a traditional incandescent bulb. 4) I use dimmers for most of my lights so that I can reduce the light and energy I use as needed. LED's are a much better option, in my opinion, but the light they produce is cold and less bright. Many people - I'm one - use dimmer switches so that we can reduce both the desired brightness at any given time and energy consumed. My 40 watt bulbs last a long time and are energy efficient thanks to the dimmer switches. The catch re LED: can't use dimmers with them, so we who have been helping reduce energy consumption all along, as well as enjoying a continuum of light, from very low to full strength, will be out of luck. 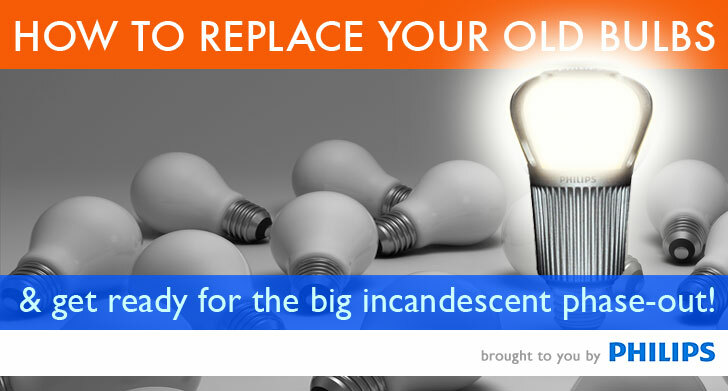 Are Halogen bulbs considered "traditional incandescent"bulbs? They do produce more light with less energy. Are they going to be phased out? What's the difference between a phase-out and a ban? Effectively, nothing. In a couple of years I will no longer be able to buy traditional incandescents. That's a ban. Why shouldn't I be free to choose incandescents if I prefer them? The additional money I supposedly spend on them will help fund our supposedly strained energy grid. It's time for the regulation busybodies in this country to get off our backs and let us live our lives the way we choose. Another issue for renters: Don't forget to take any CFL or LED bulbs that you installed in permanent light fixtures with you when you move! Otherwise you'll never see the full potential cost savings. I had replaced several hallway, closet, and outdoor bulbs in my former rented home with CFL's, but I kept the original incandescent bulbs I found in those fixtures. When it came time to move, I placed the old bulbs back in those fixtures. Hey, I spent over $240 on those bulbs! No way I was just going to leave them behind. 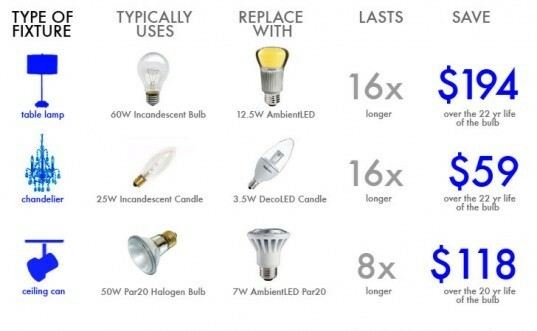 Again, I am in favor of saving energy and using CFL's whenever possible, but let's be fair and compare the best CFL and LED technology with the best incandescent technology. My high quality 57, 60, or 71-watt incandescent bulbs cost around $1.50-$2.00ea and last about 18-24 months depending upon the application, not less than a year like the super-cheap store brand bulb shown in the infographic. So that's about 10-13 bulbs over 20 years, not 21 bulbs. Curious...if a CFL bulb lasts approximately 6.6 yrs, why do I have to replace so many that are less than 1.5 years old? One chart says a 60W bulb puts out 860 Lumens, then your article continues and says that a 6OW LED replacement bulb puts out the same 800 Lumens that a 60W incandescent bulb does.....60 Lumens is a pretty big difference. Also all of this is irrelevant because you only mentioned energy savings. I would suspect a lot more people live paycheck to paycheck these days and they would take a $0.25 bulb over a $30 bulb every single time. I replaced all of my bulbs with 100W CFL replacements 6500K. $14/ea and they started burning out in less than a year. I should have just gotten cheaper bulbs that last the same amount of time. Hi Tcutri- Did you read the above article? Depending on how many lightbulbs you have, you'll save $200-$1000 a year in energy costs every year with LED bulbs + you only need to buy LED bulbs once, since they last 22 years, meaning you easily make the initial upfront cost back in a matter of months. LED bulb prices will gradually drop as demand increases and economies of scale kick in, but it is going to be like computers and cell phones - it will take time. I would have to take out a 2nd mortgage to replace all the bulbs in my house. No doubt there is an energy savings but from a life cycle cost standpoint it still doesn't make sense. What is the prognosis on the future drop in LED prices? I prefer the Lighting Science Definity A19 bulb, but Philips' Ambient is excellent for most A-lamp replacements. I ordered a bunch of LED bulbs, and when I got them the box was was labeled 'do not use in enclosed fixtures. Almost every fixture in my house is enclosed, so I'm not sure what to get. kjacquin: You are forgetting the energy savings... It's a 24-pack of 60Ws versus one 12W LED. That means five times less energy consumption, so after 20 years it will have more than paid back. I started replacing my CFL's with LED's 5 years ago. My utility bill went down 40%. Energy consumption went down 30%. At that time LED's were about $50 each and were not dimmable. Now you can buy some for $20 each that are dimmable. This is great! I think with the soaring energy cost, making little changes like this should be on everyones mind. However, your phase-out timeline and handy facts should give them even more reason to make the big switch. I am all about saving where I can. The issue is that the energy bulbs are still expensive. The images show 21 normal bulbs for 20 years and 1 LED for 20 years. Out of pocket cost is still way different. I can get a 24 pack of 60W incandescent bulbs under $15 when 1 LED is around $25+/-. Once I see the price lower I will be happy to switch. I love that you point out that energy-efficient bulbs can give off warm lighting - no more excuses to stop buying incandescent! This is a great guide - I'll have to start swapping my bulbs. thanks for this! i'm definitely going to make the switch, it saves money & energy! Just bought a 10 watt Phillips L_prize bulb with the local utility taking $20 off. Very useful info. I'm anxious to try the Philips AmbientLED. Great tips. Planning on decking out my lighting fixtures with LEDs. Great post! Important for everyone to learn about... spreading the word! Wow super informative and helpful I've been trying to make the switch myself, and this makes things a lot easier. By now, most of you have probably heard about the incandescent light bulb phase-out starting this year (likely as a result of the ridiculous political bickering about the lighting legislation in the count-down to the end of 2011). However, a quick survey of your friends will reveal that few of us actually understand what it entails. The law is merely a way to encourage consumers to purchase more energy-efficient light bulbs - such as LEDs - that will save money and energy, both resources that we could all use more of at the moment. If you're still unclear about what the incandescent phase-out means in terms of what kinds of light bulbs you'll be able to find at stores in the coming years, or how you can switch to LED light bulbs while still maintaining the same quality and quantity of light supplied by your old incandescents, read on as we spell it out for you in our easy guide. And though we will be seeing less and less of Thomas Edison's most famous invention over the next few years, we think that even Mr. Edison would be swapping his incandescent bulbs for LEDs if he were alive today!